When people talk about wanting to lose weight what they normally mean is that they want to lose fat. When a person takes in fewer calories than they burn they will lose weight. What you eat and what types of exercise you are doing can affect how much of the weight loss is fat and how much of it is muscle. On average 75% weight loss is fat and 25% is muscle. Isn’t that disappointing, if you lost 40 pounds, you really only lost 30 pounds of fat! Fortunately if you know what you are doing you can prevent this from happening. Your body adapts to your needs based on what you do on a daily basis. If you are dieting and running a lot then the message it sends to your body is that you need to burn reserve fuel (fat and muscle) to survive and you need to build stamina for running. You aren’t sending the message to your body that you need your muscles for heavy lifting because you aren’t lifting weights. During dieting you are simulating a famine so your body purposely metabolizes your muscle because muscle requires more energy than fat even if you aren’t moving or exercising. Lifting weights stresses your muscles and breaks them down. It sends a message to your body that you need to rebuild your muscle stronger than they were before so that the task of lift weights is easier for you in the future. Our body adapts to the task at hand. If you lift weights while dieting you send the message to the body that you still need muscle and it should not be burned for energy. If you are only going to the gym once or twice a week while on a diet I would recommend you focus on weight lifting. Hit each muscle group for at least one exercise a week with three sets. This will provide protection to your muscle and will allow you to lose 100% fat. If you are able to go to the gym more than twice a week then add in some cardio. Although you burn more calories doing cardio, a lot of that weight loss will be muscle and new research indicates that cardio may not burn nearly as many calories as we originally thought. There are other reasons to lift while losing weight. While on a diet, a person’s bone density decreases. Lifting weights helps prevent this from happening. Weight lifting helps to build stronger bones. 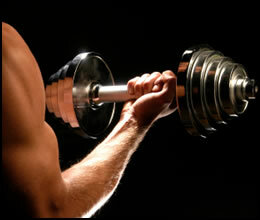 Gaining muscle also helps improve insulin sensitivity which will help your lower your hunger and makes dieting easier.